Given all the hoopla surrounding the topic of DNSSEC, it's definitely time to get prepared for it. After all, the last of the root name servers ( J-ROOT ) will all be serving a Deliberately Unvalidatable Root Zone or (DURZ) by May 5th. On July 1st however, there will be distribution of a validatable, production, signed root zone. Signing of the root zone is key for creating the "chain of trust" or a secure delegation hierarchy. DNSSEC securely signed zones vouch for their children's keys, but some higher level entity must vouch for the keys of these zones. The signing of the root will act as a trust anchor for top-level domains such as .com, .edu, etc. These zones will trust on down the hierarchy when configured to do so. Please see http://www.root-dnssec.org/documentation/ for details on the DNSSEC Signing of the root name servers. In the last article, we discussed 10 reasons to use the Unbound DNS Server. 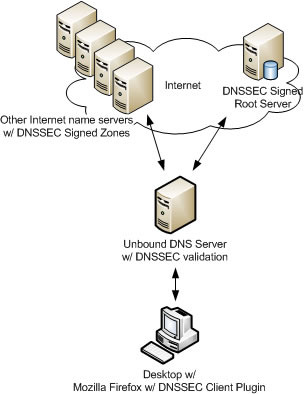 One of Unbound's main capabilities is its ability to perform DNSSEC validation. So, we thought we'd write an article explaining how you can setup the Unbound DNS server to perform DNSSEC validation as part of an end-to-end example of how DNSSEC works. Linux package names and their versions will vary between different Linux distributions, so you should consult your distribution’s package repositories and documentation prior to preparing to configure, build, and install Unbound. For the purposes of this demonstration, we chose to install from source code. Production servers should never have development libraries, compilers, and build tools installed, so it's strongly recommended that you do not build software on the same systems that are targeted for production. In our configuration we specify the interface directive to bind the DNS service to the loopback and primary Ethernet (eth0) interface on our system. The access-control directive configures an Access Control List of sorts by defining and allowing an address range to query our name server with recursive queries. While it is true that you can run the Unbound DNS server without having to configure the root-hints, we will use this directive in the server section because we want to force our server to use special DNSSEC Demo root name servers operated by IANA which have a signed copy of the root zone. Create the root-hints.txt file in /usr/local/etc/unbound and populate it by using the data from the following link: https://ns.iana.org/dnssec/dnssec.hint.txt. Make sure it is owned by the unbound:unbound user. Since this is an introduction to end-to-end testing, we demonstrate how to enable DNSSEC validation using the auto-trust-anchor-file directive in the server block of the configuration. For production installations of Unbound, it is highly recommended to either use RFC 5011 style auto-update of trust anchors (supported by the auto-trust-anchor-file directive), or to use DLV (dlv.isc.org) as mentioned above. To configure the Unbound server with the auto-trust-anchor-file, create one (1) trust anchor file per zone, and populate that trust anchor file with only those DS or DNSKEY records that are associated with that zone. Make sure that the key material is up to date and is valid before you begin. Start by creating the file /usr/local/etc/unbound/root-ta.txt, and populate it with the DS record set found at https://ns.iana.org/dnssec/dsset-. Next, create the file /usr/local/etc/unbound/arpa-ta.txt, and populate it with the DS record set found at https://ns.iana.org/dnssec/dsset-arpa. Ensure that both of these files are owned by the unbound user with read/write permissions. Alternatively, we could issue queries to our Unbound Server using dig with the +dnssec option and check the response from our Unbound Server. If the response from Unbound returns AD in the flags section of the reply message, we have established that the data was authentic. If you achieve these same results, then you've successfully configured a recursive validating server with Unbound! Congratulations. To complete an end-to-end test of DNSSEC validation, we thought we'd recommend using the Mozilla Firefox browser, along with a DNSSEC validation Add-on to demonstrate how DNSSEC validation will be supported in the future. We installed the DNSSEC Validator version 0.15.1alpha using the latest version of the Mozilla Firefox browser. You can obtain the add-on by navigating to http://www.dnssec-validator.cz/. There is a link to perform the installation on that page. Once installed, modify the Validator's Preferences. Modify the settings so that the Resolver used by the Add-on is defined using the IP address of our Unbound DNS validating resolver. In our example, we show the add-on to be configured with 192.168.0.101, the IP address we assigned to our Unbound server. Click OK and save the configuration. Test the following URLS in the table shown below. You should get the same Indicator as shown for each of the URLs. The indicator will appear immediately to the left of the URL in the URL/Address entry field. The domain name is secure using DNSSEC technology and the integrity of the DNS Response has not been breached during transmission. The browser uses IP addresses that have been validated by DNSSEC Validator using DNSSEC and are trusted. The domain name is secured with DNSSEC technology, but the DNS server resolver used cannot verify the signature validity. http://www.rhybar.cz WARNING! 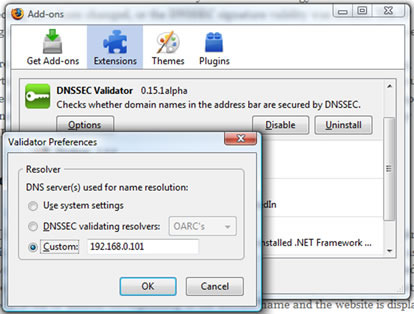 The domain name is secured by DNSSEC technology but the IP addresses to which your browser is connecting have been changed, or the DNSSEC signature validity was broken. The IP address could have been changed during transmission to your computer by an unknown attacker, or it may be a local settings conflict on your computer. These are just a few URLs to get you started, with known results. Safely surf the web now, and try some of your old Internet haunts. See who's signing and who's not. See who has been potentially compromised, and whose zone(s) are invalid or improperly signed. This blog entry was written to demonstrate how DNSSEC works end-to-end using the Unbound DNS Server to provide recursive caching and validating DNS service. Come July 1st, the production root name servers on the Internet will be fully signed, and the next big phase of DNSSEC will begin, the Adoption Phase. It is during this cycle of DNSSEC rollout that the TLDs like .com and .edu will be signed. Additionally, we'll begin to see more and more ISPs offering DNSSEC signing for customers to have their own zones signed. Widespread adoption will require more add-ons like the one we demonstrated in the latter part of the article, as well as, having more tools, applications, and operating systems with built-in DNSSEC validators. If you haven't worked with Unbound, we urge you to do so. Unbound is very lightweight, high-performing, and easy to configure. It brings software diversity to the DNS monoculture that has been primarily owned by the ISC's BIND software. Every ISP and/or Enterprise should consider incorporating Unbound into future deployments of DNS serving software and especially when DNSSEC widespread adoption takes hold. Men & Mice is now offering enterprise grade support for the Unbound DNS Server.